The Labor Day weekend was a washout for much of the north Gulf Coast as Tropical Storm Lee lumbered ashore 50 miles west of Lafayette, La., early Sunday, dumping 10 to 20 inches of rain on Louisiana, Mississippi and Alabama. New Orleans, drenched by more than a foot of rain, weathered the 45-mph storm with scattered street flooding, its upgraded levees and pumps handily managing the rainfall. The Army Corps of Engineers strengthened New Orleans’ flood control system after Hurricane Katrina flooded 80 percent of the city in 2005, killing 1,500 people and causing $80 billion in damage. Emergency managers evacuated residents from low-lying coastal areas of Louisiana and Mississippi, including the towns of Lafitte, Crown Point and Barataria in Louisiana, in anticipation of Lee’s surge. Mississippi authorities evacuated 45 families from apartments because of nearby creek flooding. 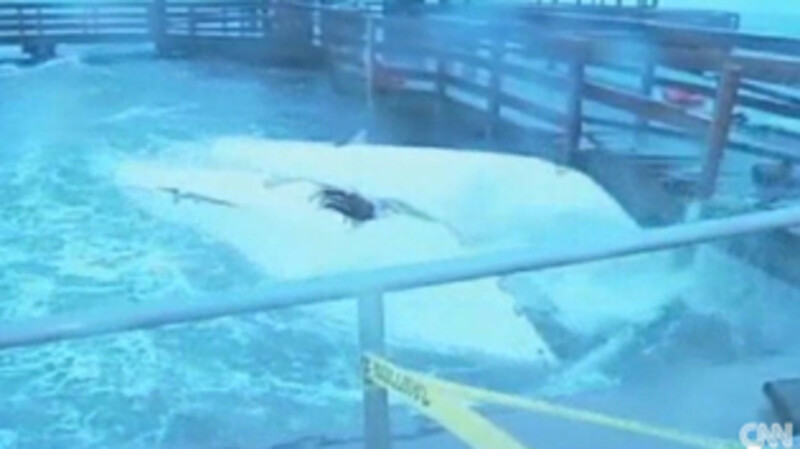 Click here to watch several people try to corral a power cat as it slams into a pier in Pass Christian, Miss. Click play to watch boats in raging currents caused by Hurricane Irene on Catskill Creek, a tributary of the Hudson River in New York. Many last-fling-of-summer Labor Day festivities were canceled. The 50th Original Redfish Rodeo at the Bridge Side Marina in Grand Isle, La., was postponed, the make-up date undecided at last report. “We got a lot of high winds and high water,” but the marina suffered little damage from Lee, says Dodie Vegas, whose family owns Bridge Side. She says roads to the island were under water Sunday and that Lee’s surge “beat up” the levy protecting the island’s campgrounds. Lee pushed inland from the coast Monday as a 35-mph extra-tropical low, spawning tornadoes in Alabama and Georgia and dumping record rainfall in Tennessee — 10 inches in Chattanooga. Forecasters worried about more flooding in Virginia, West Virginia, Pennsylvania, New York and Vermont and on the Monongahela, Allegheny, Juanita, Shenandoah, Potomac and Susquehanna rivers, with 4 to 8 more inches of rain predicted from Lee. The ground in these states is already saturated after the drenching from Hurricane Irene a week earlier. As of Tuesday, five people were reported to have died in Lee-related incidents. Meanwhile, Hurricane Katia was rated Category 3 and was 365 miles southwest of Bermuda on a northwest track into the western Atlantic between Bermuda and the U.S. East Coast. The storm is expected to ride between the Bermuda High and a closed mid- to upper-level low over the Tennessee and Ohio valleys. Then it will become embedded in west-to-east jet stream winds that will turn it northeast into the North Atlantic, according to Tuesday advisories from the National Hurricane Center.